For more than 18 years, Mark Izraelewicz has delivered winning results to clients such as Amgen and Eli Lilly. 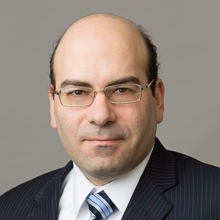 Mr. Izraelewicz leads the Firm’s Hatch-Waxman pharmaceutical litigation practice. He has tried cases as a first-chair trial counsel, and argued appeals to the Federal Circuit. Mr. Izraelewicz’s success comes from his scientific background in synthetic organic chemistry, and experience prosecuting patent applications. Mr. Izraelewicz has represented Spectrum Pharmaceuticals in a series of litigations and at trial, including serving as Spectrum’s first-chair trial counsel in a January 2015 bench trial, and in the subsequent appeal, in a case concerning Spectrum’s oncology drug Fusilev®. Mr. Izraelewicz’s ability to analyze and master issues efficiently flows from his training as a scientist, with a master’s in chemistry, cutting edge research at The Scripps Research Institute, and applied work at Abbott Laboratories. Mr. Izraelewicz has been selected as one of the “World’s Leading Patent Practitioners” from 2015-2018 by Intellectual Asset Management (IAM) magazine. In 2013, he was selected for inclusion in the Illinois Rising Stars® list, featuring outstanding young attorneys in the state. Served as first-chair trial and appellate counsel in litigation asserting Spectrum Pharmaceuticals’ patent to block FDA approval of Sandoz’s Abbreviated New Drug Application to market a generic form of Spectrum’s oncology drug Fusilev®. Successfully tried a case concerning the ownership of patents covering Applied Biosystems’ next-generation DNA sequencing machines for Illumina in the U.S. District Court for the Northern District of California. As a member of the trial team, successfully protected Amgen and its blockbuster drug Epogen® against an attempt by Hoffman-LaRoche to bring a competing product to market in the U.S. District Court for the District of Massachusetts. Mr. Izraelewicz assists clients in all aspects of patent practice, with an emphasis on patent litigation in the U.S. District Courts. He has technical expertise in chemistry, biochemistry, and biotechnology. Mr. Izraelewicz received his law degree from The University of Chicago Law School, where he was a Baker Scholar. Prior to law school, he was a chemist at Abbott Laboratories in North Chicago, where he developed processes for production of drug candidates for use in biological testing. While completing his M.S. at the University of California-San Diego, Mr. Izraelewicz was the recipient of the Harold C. Urey Graduate Fellowship. As a graduate student, he engaged in cutting-edge research at The Scripps Research Institute under the direction of Professor K.C. Nicolaou. Mr. Izraelewicz’s primary research interests focused on the total synthesis of complex, naturally-occurring compounds. He received a B.S. in biochemistry from the State University of New York at Buffalo, where he conducted research in both chemistry and biochemistry and was the recipient of the Ronald E. McNair Undergraduate Research Fellowship for the promotion of undergraduate scientific research. “Avoiding Willful Infringement Under the Evolving Willfulness Standard,” IP Strategy Summit: Orange County, February 23, 2017. “Strategies to Avoid Willful Infringement Under the Evolving Standard for Willfulness,” IP Defense Summit: Boston, November 3, 2016. Spectrum Pharmaceuticals, Inc. et al. * v. Sandoz Inc. Spectrum Pharmaceuticals, Inc. et al. * v. Mylan Teoranta et al. Allos Therapeutics, Inc., et al. * v. Teva Pharmaceuticals USA, Inc., et al. Eli Lilly & Co.* v. Synthon, Inc. et al. Amgen Inc.* v. F. Hoffman LaRoche et al.